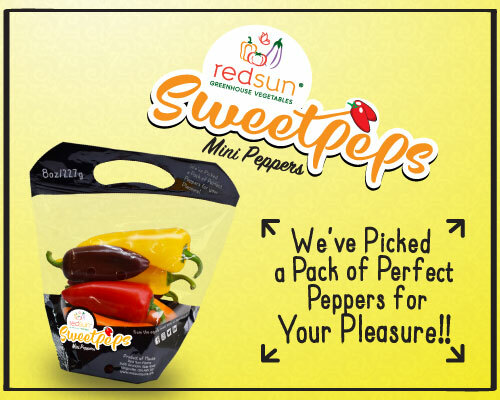 What would it look like to have a variety of the most perfect mini sweet peppers at your fingertips? It would look like a bag of our perfectly ripened, perfectly sweet, perfectly crisp Sweetpeps! Don’t underestimate their size, these colorful little peppers will be the life of your plate with their colorful, crunchy little selves! We picked a pack of perfect peppers for your pleasure (and Peter Piper would be the first to agree)! This snacking pepper, with a sweet flavor profile and being healthy to boot, these mini peppers are an ideal snacking treat for adults and kids alike. To dip or not to dip will be the only question you’re challenged with, otherwise they’re a no-brainer! They not only look and taste great, they also offer a fun, convenient, resealable bag, perfect for packing and snacking at the park, the office, school or wherever your adventures take you! There’s a secret to growing these pretty little peppers and we’ll let you in on it… our Red Sun Farms High-Tech Greenhouses provide us with everything we need to grow them with consistent flavor, crunch and top of the line quality, 365 days a year! They’re bursting at the bag to get into stores and in your shopping cart, so keep an eye out for them soon! Warning! Not to be eaten in quiet areas such as libraries and movie theaters as the intense CRUNCH may cause disruptions and initiate compulsory sharing!